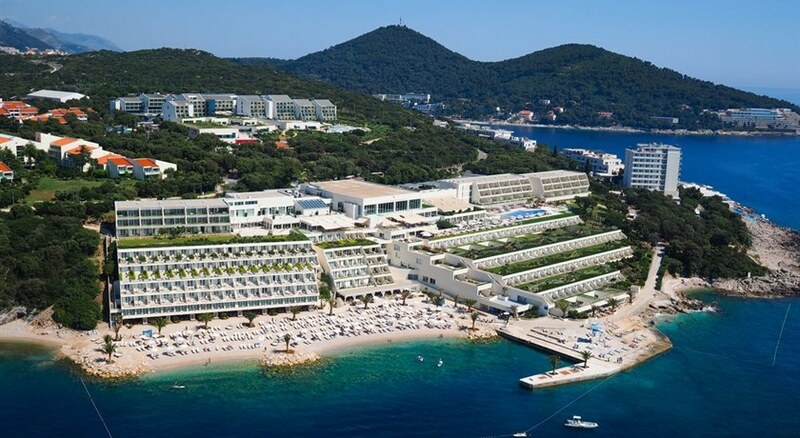 The 4-star Valamar Dubrovnik President Hotel enjoys a lovely beachfront location on the Riviera with views of the Elaphiti Islands, 6km outside of Dubrovnik City, Croatia and set amid mature gardens fronting the Adriatic Sea. 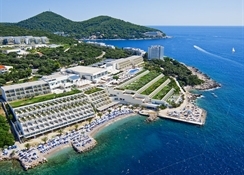 The modern Valamar Dubrovnik President Hotel has a total of 180 smart varied rooms over 7 floors in a tiered elevation offering sea views. You can savour a choice of dining venues and cuisines, snacks and refreshments and beverages; enjoy spa and fitness facilities; a range of recreational activities onsite and nearby; direct beach access and organised daily events, including a Kid's Club, and entertainment and evening music. 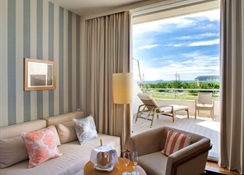 The 4-star Valamar Dubrovnik President Hotel has it all for a comfortable and active holiday on the Dubrovnik Riviera of Croatia; book now and look forward to the experience. Getting to the hotel: 22km from Dubrovnik International Airport. Local tips: There is a regular bus service to the historical Dubrovnik Old Town. Take some excursions to: Dubrovnik Old City centre; a Cilipi Folklore tour; Elaphiti islands - Kolocep, Lopud & Šipan; Jeep safari in Konavle; Mediterranean gardens in Trsteno; Pelješac wine & vineyards; Island Mljet - national park; Medugorje - world-famous pilgrimage site and many more. 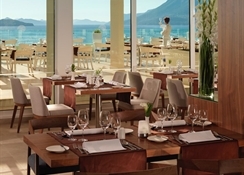 Food, drink and entertainment: Main buffet restaurant with a sea view terrace serves a rich breakfast and evening dinner with show cooking and theme evenings of Croatian and Dalmatian dishes and entertainment of "a capella" singers, vegetarian meals and special diets catered for, and lunch boxes available with 24 hour notice; Elafiti a la carte restaurant offers Mediterranean specialties; an a la carte beach restaurant includes snacks, beverages, ice creams and cocktails and offers a fishermen's night theme (July & August); and the lobby bar has a comfortable sea view terrace. There is regular evening music entertainment in high season. Sport, games and activities: A Wellness Centre (free) includes heated indoor pool, solarium with sun beds and parasols, Finnish sauna, infrared sauna, steam bath, hot tub, Kneipp foot bath, 2 relaxation rooms & garden, facial & body treatments, massages and a cardio-fitness suite; various sports and recreation programmes available during high season; tennis courts and equipment hire 400m from the hotel, and a range of sports activities in the vicinity. 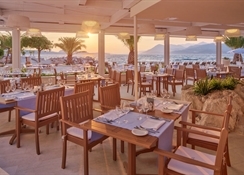 Pebble, rocky and stone-paved beaches are in front of the hotel with external water sports available and a Diving Centre (charge); towels, showers and changing rooms available, sun beds and parasols for hire. For the kids: Maro Club offers an activity programme for children in high season; a playground and sports facilities. Additional: 24 hour Reception Services, housekeeping, room service (24 h), free WiFi internet access, free Internet caffe in the lobby, currency exchange, guest relations desk with ticket service, sightseeing & excursions arranged, 2 panoramic lifts, 3 flexible meeting rooms with conference facilities for 200 people, 2 smaller conference rooms for 80 people, hairdresser, tobacco & souvenir shop and parking (extra charged). Set in the peaceful oasis of Babin Kuk, one of the most beautiful locations in Dubrovnik, this hotel allows guests to enjoy the sea views whilst comfortably ensconced in one of the 181 hotel rooms. 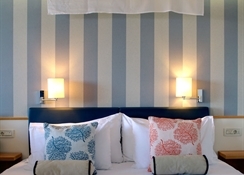 Whether relaxing or concluding important business, guests can treat themselves to superior service, whatever the season. The warm days and nights are perfect for intimate relaxation on the beach, whilst the spa centre offers complete comfort and the perfect environment from which to banish everyday stresses and strains. The 7-storey hotel is fully air-conditioned and welcomes guests into its lobby with 24-hour reception, currency exchange facilities and lift access. Guests will find a hairdressing salon on site, as well as a bar and restaurant. Conference facilities are provided and Internet access is available for a fee. Guests arriving by car can leave their vehicles in the car park and younger guests can make friends in the kids' club. Check-in is from 2 pm to 6 pm and guests are requested to check out between the hours of 8 am and 10 am.